Antonio de Pineda y Ramirez was both a military officer and scientist for the Spanish crown, being most famous for his botanical research. Heading the scientific expedition under the auspices of King Carlos III, he sailed across the world collecting data in different countries, which eventually lead him to the Mariana Islands in 1792. After spending twelve days on Guam, he observed both the geological and zoological aspects of Fort Santo Angel, a small fortification at the entrance to Umatac Bay. Shortly after his departure from Guam, he passed away, leaving behind valuable scientific information about the island. The purpose of this study is to investigate the importance of the Mariana Islands to Spain at the beginning of the 19th century when the Spanish Empire had fallen into decadence and had begun to suffer the loss of its overseas possessions. There is a void in the 19th century literature of the Marianas, a period during which it has been succinctly said the islands were ignored by Spain, yet writers have failed to explain the reasons for the lack of attention or the conditions in the islands at the time. This void is the focus of the study. This report written by Governor Francisco Olive contains his insights about the social, political, and economic conditions of the Marianas. He focuses on the underdevelopment of the islands and draws the Spanish Government to look back at the colony’s history, specifically the second half of the 19th century. The report reflects the colonial mentality of Olive, who stresses the responsibility of the Spanish Government to the inhabitants of the Marianas, leaving unchallenged the right of Spain to maintain its sovereignty over the islands. At various times during the nineteenth century, administrators, missionaries, and government officials had stressed the poor economic conditions of the Marina Islands, pleading for the implementation of administrative and economic reforms. But the cost that reforms for those remote colonies represented to an impoverished government, coupled with the immediacy of domestic and foreign problems, impeded their implementation or reduced them to a minimum. The Organic Act of Guam and related federal laws provide the framework for the government of Guam. This publication's purpose is to present the fundamental laws creating the Territory of Guam and its government. Similarly, while there have been many cases interpreting various aspects of the Organic Act, this publication includes only appellate ones. It also contains all amendments made through June 11, 2001. The Organic Act of Guam and related federal laws provide the framework for the government of Guam. This publication presents the fundamental laws creating the Territory of Guam and its government. Histoire des isles Marianes (History of the Mariana Islands), written in Paris in 1700, provides a detailed glimpse into a tumultuous and critically significant period in the history of the Mariana Islands and the Chamorro people – the period commonly referred to as the Spanish-Chamorro Wars. Guaiyayon na Trongkon Mansanita (The Loveable Mansanita Tree) highlights the special bond shared between three young sisters, who found sanctuary and adventure under the canopy of their loveable mansanita tree. Set in 1950s Guam, this book captures a time when children discovered joy in nature and in each other. 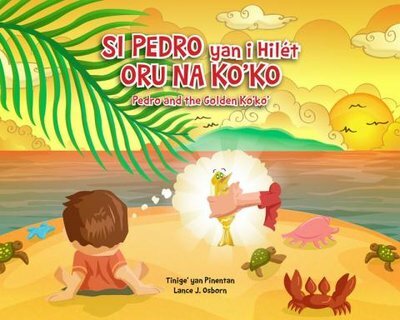 Si Pedro yan i Hilet Oru na Ko’ko’ (Pedro and the Golden Ko’Ko’) is an exciting tale of a young boy named Pedro from Malesso’, who is on a quest to capture the clever Golden Ko’ko’. The Golden Ko’ko’ only comes around every 100 years, and Pedro, determined to catch him, spends his days setting up traps along the Ko’ko’s path in southern Guam. Children of Chuuk Lagoon examines the everyday lives of school-aged children in the Chuuk Lagoon island of Romonum in the Federated States of Micronesia. The book documents the natural histories, and home and school experiences of 12 case-study children ranging in age from 6 to 14.